Thread: My first BTS Exhibition... Some questions??? Well I've gone and done it... I've booked the Ferry for May, I'm actually getting to go to this years BTS Exhibition!! I couldn't go last year and I was gutted! This will be my first time going so I'm really excited & can't wait (and yes... I know it's only January) to experience it, not to mention pick up some nice 'T's!! I have a few questions... If anyone can give me an answer it would be very much appreciated, so thank you in advance..
1) The Exhibition starts at 11:00am, what are the queues like & how early should I arrive? 2) Is it necessary to preorder from sellers? 3) Do sellers mind holding on to your purchases for you until the end of the Exhibition & what are the pros and cons of doing this? Well I've gone and done it... I've booked the Ferry for May, I'm actually getting to go to this years BTS Exhibition!! You do realise that this is the point of no return ? 2) No it is not necessary to preorder BUT many selllers will advertise their stock before hand. This is your chance to get that particular rare species that you have always wanted or a rare sexed spider that catches your attention. Many people will have a few preorders but after picking them up will go around and browse further. 3) Some sellers dont mind and other sellers prefer not to. Dont forget that many sellers will have many hundreds of spiders and will of course put your order to one side but then dont really wont to take responsibility for your spider(s) after you have paid for it/them. Bring a decent size bag carry your haul around AND a box that can be left in the car. The spider tubs can then be transferred into the box when you have left the event. I would suggest that a FLAT bottomed bag be obtained to carry your purchases otherwise your tubs and vials will be rolling around a normal carrier bag. IE ASDA sell something called 'Bags for life' (?) which is a good sized strong nylon flat bottomed shopping bag for very little. I have a small platform trolley and some folding plastic crates with lids which I could bring, which should keep my purchases safe... And eliminate the need to rely on sellers to hold onto anything for me. Plus it's easier to push a trolley than lug around a bag for hours. I assume you're heading to the Exhibition yourself? Not the best idea that ive heard this century not the worst but not far from it. I know this year is going to be held in a larger hall but as this a new hall in a new venue (last year was in same venue but smaller hall) I can only go on previous years experiences and pushing a trolley would be like pushing a pram . . . .DEFINITELY NOT something to be recommend in the expected crowds. I usually take a small flat bottomed IKEA bag when i go to Marbach (Germany) and can easily fit several adults and multiples of slings in it. Regarding acrylic enclosures. Personally I would avoid them like a kick in the head. Yes they look very pretty BUT they will collect scratches like a squirrel collects nuts during general use and cleaning and after a while they generally look crap AND they are bloody expensive for you get for your money. They also have (or had) a bad habit of 'popping' when exposed to heat and/or humidity. These are my glass tanks for AF arboreals, custom made by a local shop. Can you imagine dragging a trolley around in this crowd ? And Thanks also for your advice regarding acryillic enclosures, you saved me there! I've tried going on to the Custom Aquaria website several times, but the 'Gallery' & 'Prices' sub-pages don't work. I've googled for pictures of their enclosures and I like what I see, but I haven't found any information... what are their prices like? yours look great by the way! Is it difficult to incorporate live plants into your set up? 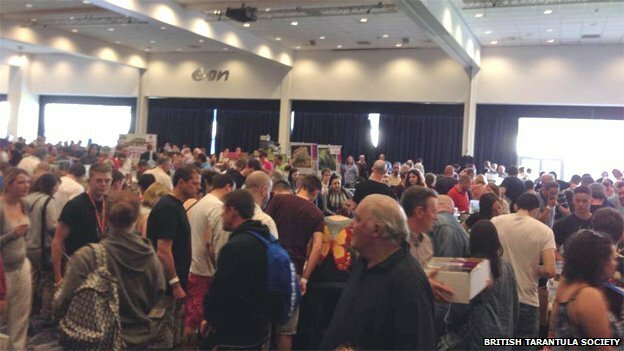 Seeing as you can't attend this years exhibition is there anything you'd like me to pick up for you? I think there was around 2,000 people through the doors last year and more is expected this year. Why do you think i said to get there early ? The crowds are another reason why many people make pre-orders, so they dont have to rush around like lunatics. And Thanks also for your advice regarding acryillic enclosures, you saved me there! I've tried going on to the Custom Aquaria website several times, but the 'Gallery' & 'Prices' sub-pages don't work. 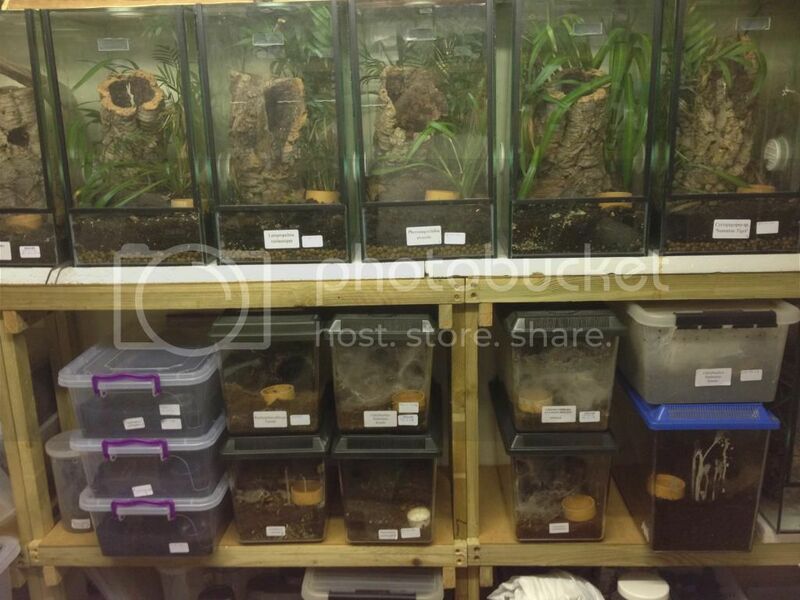 I've googled for pictures of their enclosures and I like what I see, but I haven't found any information... what are their prices like? yours look great by the way! Is it difficult to incorporate live plants into your set up? Thanks for the thought but no thanks.